The lure of archery hunting has been an age old tradtion. From the evolution of spear to projectile, a sport was born! Many people (including myself) have been daunted by the task of choosing their first bow. From draw length to pull pounds, this choice can be pivitol to a successful purchase. There are many manufacturers and models being introduced yearly boasting a wide array of different accessories, colors, cam numbers and composites but in general, most compound bows come equipped with the same basics. Study the image to the right to help learn the parts of the compound bow. 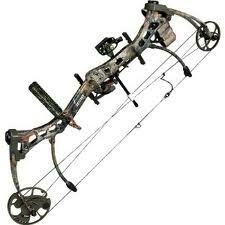 Click on a compound bow part for glossary definition.